Uglyworld #374 - A Knock At The Door, originally uploaded by www.bazpics.com. With Wedgehead "cabbaged" out on the couch today, it meant that when the doorbell rang someone else had to answer it (normally Wedgie is sooooo excited everytime the doorbell rings and it makes him sprint to the door before anyone else - basically he's damn nosey and doesn't want to miss anything). 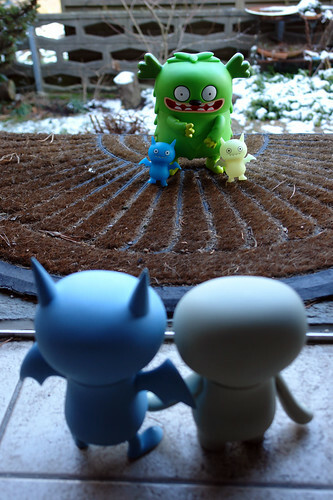 Cinko and Ice-Bat both walked into the living room at the same time as the bell rung, so they decided to head over to the door and see who was there.